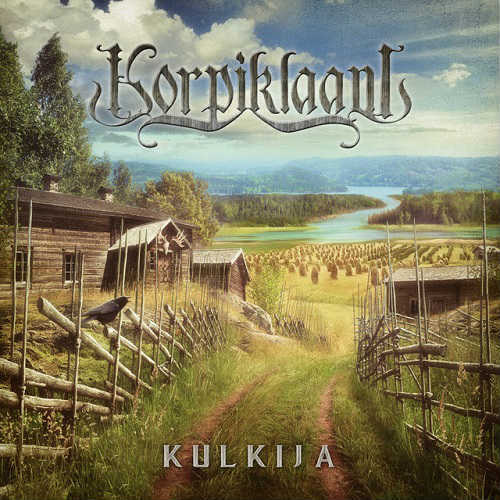 The band's frontman, Jonne, says: "'Harmaja' is an unusual KORPIKLAANI song with its slow tempo and emotional strength. The song is about longing and I managed to charge it with a great emotional atmosphere. When making the album we mostly used the first takes; we didn't get stuck in details when there was no particular need to. It was important for us to keep the emotion and mood at the forefront even if the technical side wasn't absolutely perfect at times. "I was surprised - although in a positive sense – that Nuclear Blast wanted to release 'Harmaja' as a single and a video. Usually they prefer more uptempo, fun drinking songs. The new album Kulkija of course has that material too since being over an hour long it contains the entire scope of different emotions. "I bought a new classical guitar and started to reacquaint myself with the 5-finger picking technique. I created a finger exercise that then formed the basis of the song. The exercise started to sound more and more like an actual piece of music and suddenly a melody came out of that. I sent a very basic version of the song to our lyricist Tuomas Keskimäki who, in the same evening, sent back the lyrics for 'Harmaja'. The text refers to 'Sylvian Joululaulu', a well known poem about longing by Zachris Topelius. I sang the demo in my home studio immediately and that was it - the song felt good and strong right away and I knew that it was going to end up on the album. "We managed to create a nice contrast in the video with the angel. Director Ville Lipiäinen found her accidentally while grocery shopping. I don't know if he stumbled on her wings or what, but the angel also flew to the same pool in Lohja. The story is about a man missing his dead wife who then returns from the afterlife for one last goodbye, so that the poor man can go on with his life. About 'Harmaja' ("The Grey"): The blackcap (Sylvia atricapilla), the bird in the song, has been unable to migrate south because of a broken wing. The song depicts anxiety and the fading memory. A Finnish poet Zachris Topelius wrote in 1853 a poem titled 'Sylvian joululaulu' about homesickness which is referred to by 'laulu kaipauksen' (a song of yearning) in the song. The song can also mean the "grayness" when a partner of an old couple dies.